Well, the best wooden I have ever been on. Tons of airtime, and great feelings along with that on every drop. The helix was great, and the trick-track was very fun, even though it made a rough little jog. You need to ride this. Great ride. I honestly was expecting to experience more airtime. Im not saying it didnt have any Im saying I was expecting forcefull airtime which really does not exist, there is endless floating. I had really over hyped this coaster. This was the single coaster that I was looking foward to the most of my 67 coaster trip. I was surprised by its roughness, it is completely bearable though, but I have to say during Timbersfest not a single person said anything good about the Trick Track because it is rough and beats the crap out of you. The helix is energetic and intense but for just being retracked it was a little rough. I was dissapointed by it, but still think it rocks. Great ride. The airtime was amazing on this coaster. The hills are just insane, you must ride this ride if you can! This ride is insane. I loved it. The airtime was great! A must ride for everyone! Not as terrifying as we had imagined, but every bit as exciting. This is a monument to coaster enthusiasts and should be on the "must see" route of any coaster fan. We were surprised to find that the back seat was not only a bit rough, but didnt offer a fraction of the airtime the front seat delivers. In the front, each and EVERY hill delivers major air as you cascade up and down this magnificent structure. It is hard to fathom that it was a family owned, second-tier park that had the vision and commitment to build this ride. A not-to-be-missed classic. I had visited MIA in 2001 and ridden Timbers on a hot 102* day. I liked the coaster however it did not blow me away. This year I had the opertunity to ride it both at night and in the rain. OUTSTANDING! A coaster that every element worked to perfection and unless I am still dreaming, Had me out of my seat more than I was in it! I think the one memory that will never leave my mind is looking down at the person in the front seat when I was setting in the second. This coaster is definatly a Number 10 Coaster. Filled with air time and steep drops and it is full of Gs in the helix. First you start out going up an 125 foot tall hill and then dropping a steep 120 feet before going up another hill it keeps on going out and thats where it gets its name an out and back coaster. After it goes out it turns back around you go over a few more camelback hills before getting thrown from side to side on a bumpy sort of banking track(dont worry that was done on purpose. They wanted to build it like that. It is one of the only coasters in the world to do that). After going through that pull some Gs on the double helix before turning back into the station. Last time I checked this coaster was the Number 2 best Wooden coaster in the world after Raven. 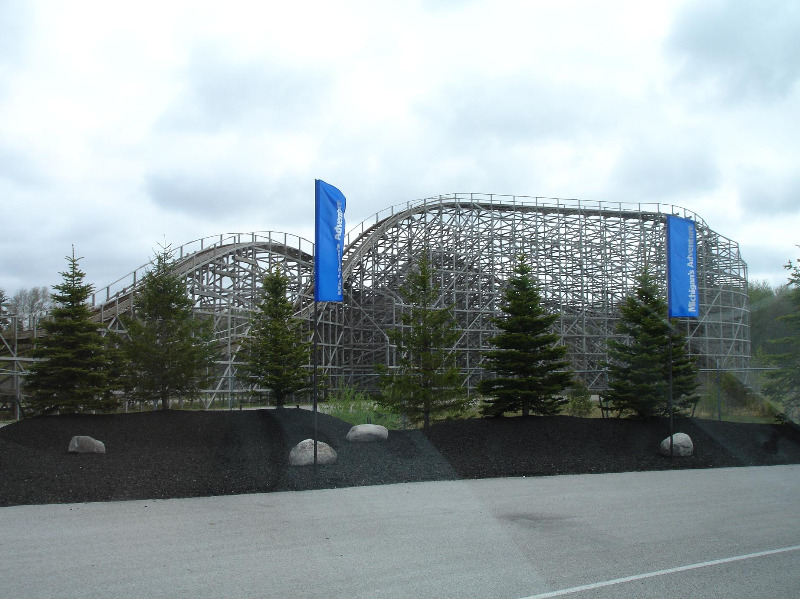 This is one of the tallest wooden coasters in the world so go to Michigans Adventure and Ride it Out. Id give it a 10 if not for coasters I like better like Raven, Legend, and Cornball, all of which have a higher surprise and reride factor that I think Shivering Timbers lacks. Exellent ride! Tons of air time throughout. This is the perfect single out and back coaster. And a short wait to boot! By far the best wooden coaster ever. Even the looks can be intimidating. It is definently a must ride. The airtime is insane and the ride never seems to let up. I highly suggest anyone who likes coasters to ride it. Especially if you enjoy airtime.